"Where sophisticated business and high environmental standards enhance the quality of life you seek. Welcome to Okotoks, strategically located 15 minutes south of Calgary." Experience the essence of healthy community living and quintessential opportunities for business in Okotoks. The Town of Okotoks is surr ounded by magnificent Rocky Mountain views, bountiful rolling hills and the splendid Sheep River Valley. Okotoks is committed to maintaining its enviable lifestyle and it shows! The town's efforts are a reflection of the residents’ desire to build a community that preserves all things great about small town living while generating unparalleled recreation, education, and employment opportunities. The town takes a unique approach to community development through its recognition of sustainability and supporting natural environments, and in implementing world-leading solutions to today’s environmental challenges. In the beginning, this specifically meant the carrying capacity of the Sheep River watershed. Over time, Okotoks' definition of sustainability has evolved into an even more holistic practice, incorporating a diversity of environmental, economic and social initiatives. The community's combined, notable efforts aimed at leaving the world a better place for our children, continue to inspire on the global stage – forging a new path that others seek to follow. Okotoks Town Council decided to initiate the proposed 60-year annexation plan to accommodate long-term residential, commercial and industrial growth. Okotoks offers unique shopping and exceptional dining opportunities in which you are encouraged to indulge. The picturesque storefronts of downtown deliver quality service, boutique and specialty shopping, and art galleries that have become a magnet for locals, day-trippers and overnight guest alike. There are also numerous new commercial developments that solidify Okotoks as the regional service centre. Strong population growth over the last decade. Okotoks offers the lifestyle edge and strong quality of life. It is one of Alberta’s family friendly communities and has one youngest average population ages in the Province of Alberta at 32.4 years of age. Okotoks possesses a highly educated workforce and above average education and income levels. Okotoks offers access to excellent health care, police, ambulance, fire services and some of the best schools in Alberta. The municipality is committed to healthy lifestyles, community involvement and a sustainable future. There is a strong community-wide environmental advocacy in Okotoks. Okotoks provides you with immediate access to world class indoor and outdoor recreation amenities including over 50 kilometres (32 miles) of interconnected pathway trails. Okotoks is a "Home-based business friendly" community, with over 600 home based businesses. The town offers competitive tax and utility rates and high amenities and services for your tax dollar. Location, Location, Location: Okotoks is a 10-15 minute drive from Calgary city limits; transportation corridors via Deerfoot Trail and CANAMEX Corridor to the United States of America and Calgary-Edmonton Corridor; and 40 minutes to Calgary International Airport. The town has fully-serviced, non-residential industrial and commercial lands available. Approximately 300 acres of developable industrial/commercial land are available for sale, lease or build to suit. Okotoks serves a trade area for commercial businesses of approximately 85,000 people. The trade area for tourism, industrial, selected retail and professional services businesses is approximately 250,000 people. Okotoks possesses among the lowest differential non-residential tax rate in the Calgary Region. In Okotoks, professional services pay business tax, all other businesses require a business licenses only. The town focuses on recreation, arts, culture, entertainment, professional, service industry and high end tourist-related activity in the downtown core. Okotoks continues to experience residential, industrial and commercial development, with values of over $96 million in 2013. Okotoks is in close proximity to Calgary, Alberta's centre for provincial and national corporate headquarters, home of the Calgary Stampede and host city for the 1988 Winter Olympics. The Calgary International Airport is conveniently located 40 minutes from Okotoks. The Okotoks Business Advantage offers a cost competitive environment in which to operate with no business tax for the majority of businesses. This allows your business to operate in an affordable environment while being located in a sustainable community. In addition, Okotoks offers one of the lowest business property tax rates in the entire Calgary Region. Non-residential tax differential rates are among the lowest of any Calgary region community. Alberta's favourable tax environment allows Okotoks to be a competitive option for business or head office relocations, branch offices or new facilities. Located in one of Alberta's finest recreation areas, Okotoks is an outdoor place. Rivers, meadows, rolling foothills, and mountains inspire an active lifestyle. In town, enjoy the Rotary Performing Arts Centre, Okotoks Museum and Archives at Heritage House, the Okotoks Public Library, the Okotoks Art Gallery at the Station, the Sheep River valley, and farmers markets in Okotoks and the region. Okotoks is a sports hub for baseball, with an indoor and outdoor training facility as well as a baseball school; in addition to lacrosse, soccer, swimming, hockey, curling, biking, running, badminton, hiking, fishing, and three local golf courses, plus an 18 hole miniature golf course. For the horseback riding enthusiast there is plenty available in the region, various trails in addition to over 800 kilometres (500 miles) of equestrian use trails throughout Kananaskis Country. The famous equestrian facility Spruce Meadows is just 15 minutes north of Okotoks. Furthermore, Okotoks is in close proximity to winter sports, downhill and cross country skiing, snowmobiling, snowshoeing, and more in the region and Kananaskis Country. Banff and Lake Louise are within a two hour drive. Visit Olde Towne Okotoks located in the heart of historic downtown for unique shopping and dining experiences. Indulge in fine-dining or more casual fare at the wonderful eating establishments and revel in discovering one-of-a-kind treasures that you’ll find in our splendid boutique shopping locales. You’ll also find exceptional home, health, beauty and wellness shops for all your needs. After shopping take in a stroll along the Sheep River and enjoy a walk on our extensive 50 kilomtre (32 mile) pathway system. Okotoks is a progressive town with a vibrant arts community. The Okotoks Art Gallery reflects this wealth of creativity and dynamic energy. It engages diverse communities and inspires a greater quality of life through meaningful visual art exhibitions and education programming. Okotoks is a town with a ric h heritage. The Okotoks Museum and Archives reflects the history of a community rooted in three centuries. The Museum promises to share the stories of Okotoks, inspiring people to connect to the community and the environment. Enjoy a variety of events every month throughout the year in Okotoks. The farms provide wonderful solutions and services in landscaping; has a lovely garden centre that provides plants, products and education; offers locally grown and processed fruit and fruit products; and provides agri-tourism experiences that give guests the opportunity to expand their knowledge of modern farming and to enjoy recreation in a farm setting. At JoJo’s cafe, the chefs are always creating something fresh and new from the on-farm garden and the wares of local producers. Sit on the patio sipping a glass of wine while your pizza is baked in the wood-fired pizza oven. Visit the Saskatoon Farm, located 3 kilometres (2 miles) east of Okotoks. It features 50 acres of u-pick saskatoon berries, a fully-stocked garden centre, unique gift shop and exceptional cafe. The Saskatoon Farm is open year-round. Located just minutes west of Okotoks, Chinook Honey Company provides wonderful natural honey, a variety of specialty honeys, honey jams, honey wine (mead), and hand crafted products. 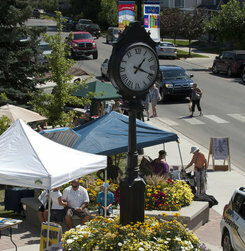 Farmers markets are held in and around Okotoks throughout the summer. www.okotoks.ca is the official site of the Town of Okotoks.